Claritin is now made more affordable at P32 per tablet, down from about P50 per tablet. The announcement was made through an event, which also coincided with the unveiling of the brand’s new TV ad and the revelation of its new celebrity endorser. <>As it continues to strive to help improve quality of lives of consumers, Merck Sharp and Dohme (MSD) has just announced the new suggested retail price for Claritin. From a price tag of almost P50 per tablet, the drug is now made more affordable at P32. Needless to say, this is good news to all price-conscious entrepreneurs and consumers in the country. This major price rollback was announced during a press conference held at Tower Club, Makati City on Wednesday (February 26). According to Raphael Carpio, category manager of upper respiratory for MSD Consumer Care, this price adjustment is also another way of showing Claritin’s appreciation for its 25th year in the local market. During the event, MSD also unveiled its newest TV commercial, which features its newest celebrity endorser, TV host-actress Iya Villania. The 30-second TV ad reiterates Claritin’s effectiveness in fighting the eight common symptoms of allergy attacks: sneezing, runny nose, itchy nose, itchy throat, watery eyes, itchy eyes, hives, and skin itching. It will start airing in major TV networks beginning March 16. 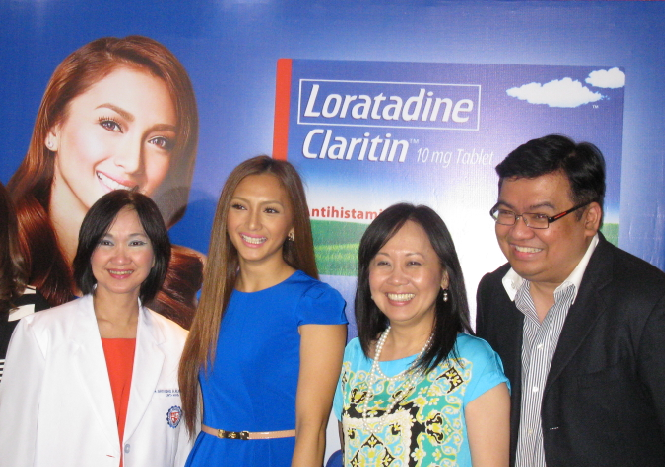 Claritin is a leading brand of antihistamine for managing allergic rhinitis. As an allergy treatment, it sets itself different because it does not cause drowsiness especially when properly taken as directed. That makes it an ideal allergy control medication for entrepreneurs, who need to be always in good condition to carry out necessary tasks and responsibilities for their businesses. MSD is a global healthcare company that works to help the world be well. MSD is a trade name of Merck & Co., Inc., with headquarters in Whitehouse Station, N.J., U.S.A. Through its prescription medicines, vaccines, biologic therapies, and consumer care and animal health products, the company works with customers as it operates in more than 140 countries worldwide to deliver innovative health solutions. It also demonstrates its commitment to increasing access to healthcare through far-reaching policies, programs, and partnerships.